Processing of change of ownership of vehicles. Issuing certificates of roadworthiness for relevant vehicles. Updating changes of particulars for vehicles. Motor Tax Online is a secure online tax renewal service provided by the Department of Transport, Tourism and Sport and Ireland's local authorities. All driving licence applications and renewals etc. are handled by the National Driver Licence Service (NDLS). All Leaner Permits applications and renewals etc. are also handled by the National Driver Licence Service (NDLS). 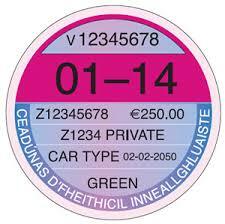 The NCT is a compulsory vehicle inspection programme in Ireland and is handled by the NCTS themselves. Tests can be booked online at their website.